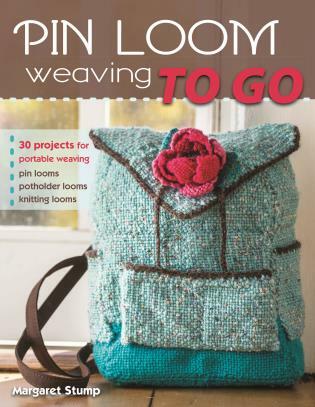 Step-by-step instructions for 25 projects you’ll be amazed were made from pin loom weavings! Pin looms are hot! These palm-sized weaving looms go anywhere and make just about anything you can imagine, from fashionable wrist cuffs to full-sized blankets. Just drop a pin loom in your project bag with a ball of yarn and you are on your way to fast, fun weaving. Margaret Stump, author of the original Pin Loom Weaving, has outdone herself with the 25 designs in this new book. There are elegant wraps, a fun fox bag, an American flag blanket, pillows, pins, stylish scarves, and more--all in a modern style that says "hand crafted with pride." With beginning weavers in mind, Margaret first walks you through how to weave on a 2" and 4" loom. Once you know how to make a basic square and connect your pieces, you are well on your way to making any of the projects in this book. The book divides projects into those that use a 2", 4", adjustable fine-gauge, and even a pot holder loom, and those that combine pieces from different looms, so it is easy to find a project and get started. Pin looms are readily available in a variety of sizes and materials. Choose a favorite pattern and a suitable pin loom, and start weaving anywhere and everywhere today! Margaret Stump is the author of the successful Pin Loom Weaving. She has been creating wonderful fabrics and projects with pin looms for more than forty years. Her work is creative, original, fun, and appealing to young and old alike. A longtime advocate for this vintage art, she is delighted to see so many artists and craftspeople rediscovering the joys of pin loom weaving. She lives in Mankato, Minnesota, and can be found online at www.pinloomweaving.com.